They say everything’s bigger in Texas. Well that’s certainly true when it comes to cows. With a bovine population of 11.7 million, almost two times greater than the runner-up state of Nebraska, Texas is home to almost 13% of America’s cows. Marrying into a family of multi-generational cattle ranchers, Renee had a difficult time watching the calves go off to slaughter. So Tommy made a decision, the repercussions of which he could never have imagined: for Renee to buy her own cow and become a part of ranch culture. And so it was that Rowdy Girl came into their lives. Rowdy truly was the gateway. Renee’s connection to the animals on her plate and those in her backyard began to deepen. You can hear about her personal conversion in depth in this video post. 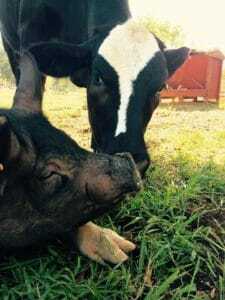 There’s of course the original herd, all of whom Renee bought from her reluctant husband, and soon the sanctuary began to take on new residents, including survivors of pro-farming youth programs like the 4H Club and Future Farmers of America, organizations firmly rooted in Texas culture. Alena Hidalgo was one of those kids, and her animal, was Gizmo the pig. Gizmo’s roommate Roux was also an FFA surrender after not making the cut at the County Fair. The high school student who surrendered her has never come back to visit. 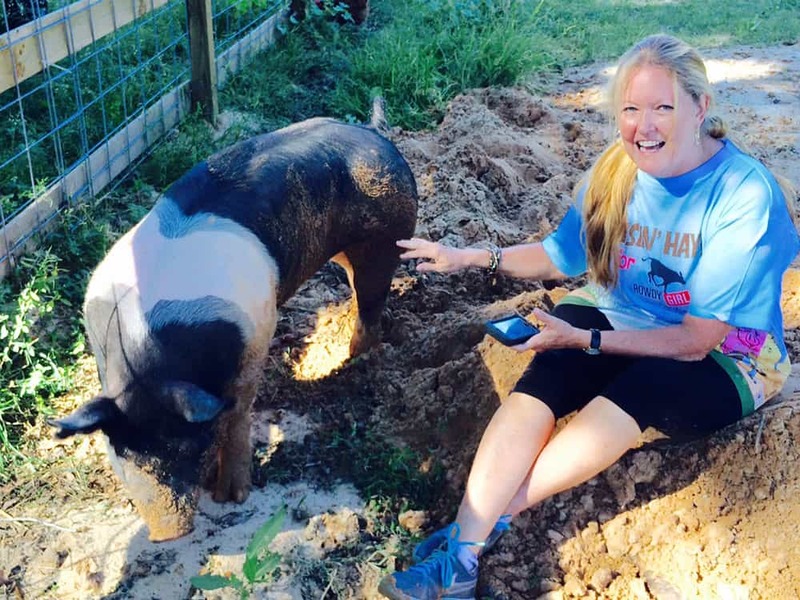 Renee and dedicated sanctuary volunteer Charles Armstrong, who was instrumental in saving fellow FFA surrender Penny Lane, shed some light on the pressures upon students in the program and why they don’t always come back to visit. Every one of these animals has a story. A history. From the survivors of our food industry we’ve met, to pets who outgrew their family’s circumstances, like ducks Quackers, Remmy and Berry and potbellied pig Lilly, to these hens who were used as bait in the brutal blood sport of cockfighting. Each individual is a miracle, and a living reminder of the trillions of others who were not so fortunate. And who would ever suspect that the place they’d ultimately find safety would be a cattle ranch in Texas? Certainly not Tommy. Renee and Tommy have big plans for the Sanctuary and are working on a number of improvements. 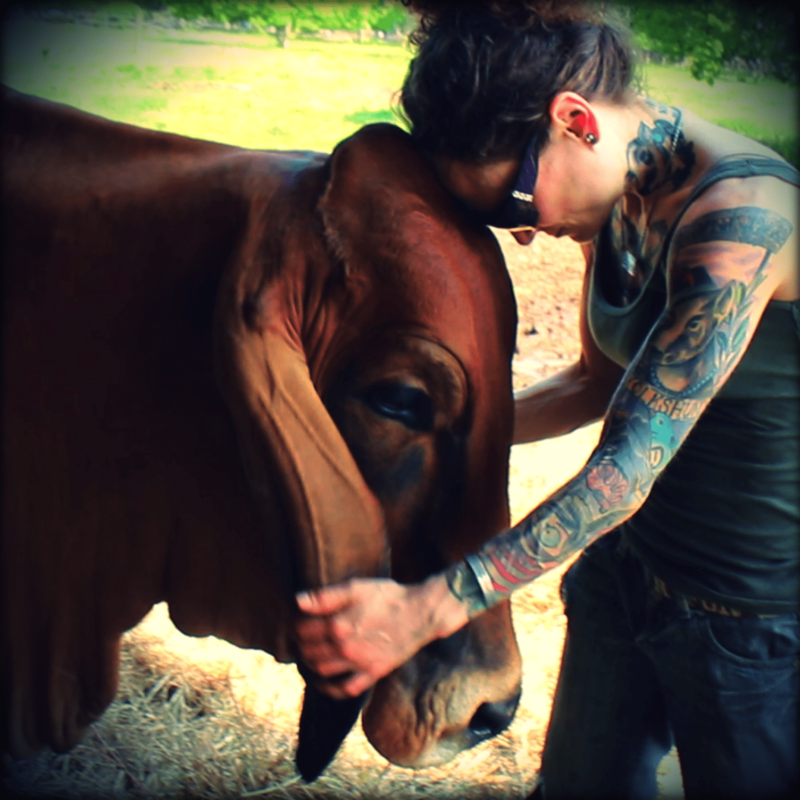 Maintaining a sanctuary is no easy task. Unlike a cattle ranch, where profit is the king and animals are inventory, a farm sanctuary means putting the animals first and hoping the finances will follow. Which is what brought me here in the first place for their 2nd Annual Vegan Awareness Festival & Fundraiser, complete with vegan cupcakes, gumbo, booths, and speakers. Renee is going to be traveling and speaking about the Rowdy Girl story, and you can find places and dates in the links at the base of this post as well as how to donate to their cause. So that’s the story of the cow who changed Texas forever. And I have a feeling that she’s just getting started. To learn more about Rowdy Girl and her fellow residents, connect with the Sanctuary, keep up with Renee’s speaking events, and to help support their mission, please see the links below. Please share this remarkable story and give the video a like if it inspired you. Be sure to subscribe to the channel for more vegan content every Monday, Wednesday and some Fridays. To support messages like this, see the support page or join us in the Nugget Army on Patreon. Now go live vegan, celebrate the survivors, and I’ll see you soon. United States Department of Agriculture, National Agricultural Statistics Service, Southern Plains Region, and Cooperating with the Oklahoma Department of Agriculture, Food and Forestry, “Cattle Inventory,” January 29, 2016, https://www.nass.usda.gov/Statistics_by_State/Texas/Publications/Current_News_Release/2016_Rls/spr_cattle_inv_2016.pdf. Commissioner Sid Miller, “Texas Ag Stats,” Texas Department of Agriculture, accessed May 22, 2016, https://www.texasagriculture.gov/About/TexasAgStats.aspx. So Sweet. I wish all humans would stop eating animals. I hope they got lots and lots of contributions to help them with their good works. FANTASTIC ! THANKS SO MUCH !!! P.S. I should have my website up within two weeks, hopefully sooner. SO great to meet you!! And excited about your site!! !